Joanne and Michal eventually decided on a Personalized Photo Wedding Invitation as they were looking for something different for their wedding stationery. 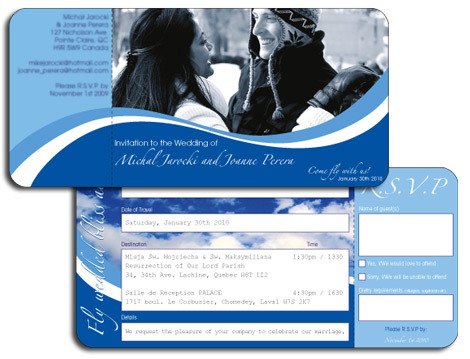 Initially the couple contacted me enquiring about some of my invitations designed to look like boarding cards. They weren't having a destination wedding but both worked in the air industry and thought it would be a novel way of inviting guests to their upcoming wedding. After a couple of phone calls using Skype (I'm from the UK and they are from Canada so using Skype is a great way of having a free conversation) Michal asked if they could supply their own picture for the background of their ticket shaped invitation. Of course this wouldn't be a problem at all. I love incorporating personal images into the invitations I create it makes them extra special and unique to that couple. The image they sent over is a lovely one of them both and worked really well with the overall design. Once the initial design was finished Joanne and Michal also asked me to recreate it in Polish for the guests on Michals side of the family. There were a few minor corrections that went back and forth before it was perfect but that wasn't a problem and is all included in the initial design fee. "Thanks Kate we LOVED the invitations and so did all the guests that received them! You were fantastic to work with, accommodating all our ideas and put together something that truly represented us. Everyone loved the originality!" Your wedding day will be unique so why not start with an equally unique invitation or save the date. Supplying your own photo to include in the design is a beautiful way of personalizing your wedding stationery. If you're planning an engagement photo shoot why not request some suitable shots are taken which you can use on your invitation. If you're getting married abroad are you planning to do a site visit before the big day? Perhaps you could arrange for your photographer to meet you there to take some photos of the two of you which can then be used on your personalized photo wedding invitation. I can usually make any photo suitable for printing but ideally you want to have it taken with any settings on high resolution (sometimes called large). This should mean the photo is good enough quality to use for printing and won't appear pixillated or blurred. Of course with trusty Photoshop I can even make do with a quick snap taken with a camera photo, it doesn't always have to be professional quality to capture the moment you'd like to share with your guests. If you have a photo in mind but aren't sure of the quality feel free to contact me and I can check for you. Looking for more ideas for a Personalized Photo Wedding Invitation? I created another design for a couple getting married in Greece. Click here to read about their Ticket Invitation.